... At Southbank, Australia Day has opened old wounds for Brisbane's indigenous population, who say their places of worship aren't being respected by authorities. About 300 indigenous Australians and their supporters rallied outside Parliament House on Saturday, calling for sovereignty to be awarded to the first Australians. "Only then can we build a just republic for all who call this place home," Wayne Wharton said. Mr Wharton was one of three indigenous people arrested at South Brisbane's Musgrave Park in December when authorities closed down the Aboriginal Tent Embassy and extinguished the "sacred fire". Brisbane City Council had shut down the Embassy at the request of elders who said it had lost its way amid violence and alcohol abuse. 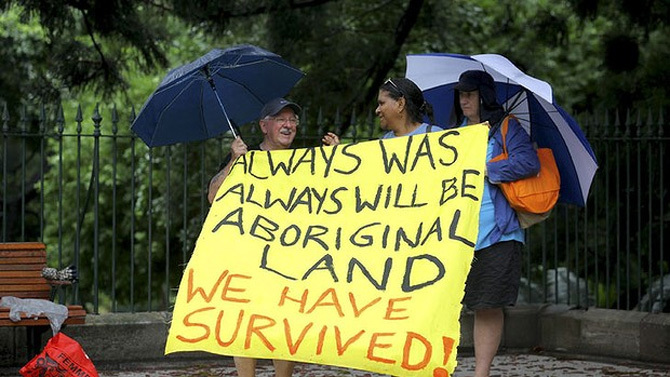 Protesters on Saturday marched from parliament house to the park, where they re-lit the sacred fire. They celebrated with a corroboree and smoking ceremony and proudly re-claimed the small section of the park was theirs again. "Everyone else is able to have their places of worship respected, yet we continue to face restrictions, harassment and intimidation from the colonial authorities when we exercise our religion and customary practices on our own land," Mr Wharton said. The group then marched to South Bank to protest, where Brisbane's main Australia Day celebrations continued regardless. The drizzle and winds didn't keep crowds from being entertained by live music, a 21-gun salute, RAF flypast and fireworks. Captain Arthur Phillip had been on Australian shores for a week when he planted the flag at Sydney Cove to claim the land for King George III and England. Perhaps he had been planning to take his time, but when two French ships appeared on the horizon off Botany Bay, Phillip had to scramble. England and France were rivals, if not outright enemies. The two vessels, L'Astrolabe and La Boussole, were under the command of the naval officer and explorer Laperouse, who was looking for scientific discoveries and potential French bases in the Pacific. Bearing orders to keep on exploring, Laperouse gave the English some of his journals, charts and letters to be carried back to Europe. The two French ships put to sea from Botany Bay on March 10, 1788, but were never seen again. Lieutenant John Shortland – who would be recorded as officially discovering Newcastle a decade later in 1797 – took Laperouse's papers back to England, from where they were sent to France. The Frenchman is remembered nowadays by the suburb of La Perouse on the northern shores of Botany Bay. But the rivalry between France and England, which could have resulted in a French flag on Aussie soil, is little more than a footnote to a history that marks Australia Day each January 26. For earlier generations, Australia Day seems to have been a patriotic but otherwise unremarkable occasion; a quiet pause for a no-nonsense nation that prided itself in forging an existence from the harsh reality of the Australian landscape. On Saturday, 225 years after Phillip stuck his flagpole in the sand, Australia Day is a far more complicated creature. Yes, there'll be barbecues and street parties and Australian flags everywhere. The Southern Cross as well as the one with the Union Jack in the corner. But there will also be plenty of talk about how Australia is changing, and how that might not be a bad thing. To start with, you don't need to have a ‘‘black armband view of history'' to accept that England stole Australia from its legal owners. From 300 years from the early 1500s, the great European powers, including England, laid waste to the New World, doing whatever it took to overpower, harness and exploit the native populations. In a similar vein, Australia Day has an ironic ring for a nation that still tugs a forelock to George III's successors on the throne by maintaining a governor-general whose election must be approved – even if it is only rubber-stamped – by the monarch of the day. While ever the governor-general is a head of state with constitutional links to England, then today should be more accurately known as ‘‘Australia Day, (With Your Permission, Ma'am)''. It doesn't matter whether the connection is a paper trail but nothing more. Until Australia stands formally on its own feet as a republic, many of our citizens will feel as though we have serious unfinished business to attend to. And while I accept that Australia Day has a growing connection to immigration with its citizenship ceremonies, I don't think the colonial baggage hanging from January 26 says much to the millions of non-Anglo migrants who now call Australia home.